Most of the 19 parking spaces on this side of Calapooia Street between First and Second were occupied Tuesday morning. The first parking issue connected with the Albany Carousel has come up before the city council. The council’s proposed solution: Reduce free on-street parking available to downtown workers, including employees of the Albany Post Office. The upshot is a proposed resolution on the council’s agenda Wednesday. The measure designates on-street parking along the east side of Calapooia Street between First and Second avenues as “three-hour customer only” parking. The resolution covers the 19 new back-in angled spaces on that side of the post office. Built last winter in the first phase of the city’s downtown “streetscape” reconstruction project, those spaces replaced eight parallel-parking spots. Like the former spaces, the new ones are usually filled by morning, presumably by vehicles of postal employees. For many years the council has delegated enforcement of parking restrictions in the core area to the Albany Downtown Association, and the resolution says the change on Calapooia was requested by the association. If the “customer-only” term is strictly enforced, it’s not clear how the change on Calapooia Street is going to do the carousel volunteers a whole lot of good when they are looking for a nearby place to park. Sure, people will want to walk from Bryant Park, that sure is convenient. Plus, didn’t the last bridge wash away? Then how much would a bridge cost? The first of many issues associated with this million dollar albatross. This will forever be a money drain. Thanks! Does anybody really think that parking will be an issue in six months to a year when the “newness” of the carousel wears off. Yes they were a hoot in the 19th century, but things have changed a bit since then. Not necessarily all for the better. Realistically it’s going to take more than painted animals traveling in an endless circle to draw the number of repeat visits necessary to keep this from becoming another drain on the taxpayer’s purse for the gratification of a small but vocal group. “You work, and I’ll eat” should be the new city motto. Hasso – given the Missoula carousel is the prototype, has anyone looked into the financials of how that city-owned “asset” has performed? I heard the operation is running in the red and dependent on the city’s general fund. Is a city-owned, city funded, carousel in Albany’s future? I looked at the Montana carousel. The article said that it did well for 7 years then the operators got complacent and revenue dropped. They are working on changing up their marketing. Downtown Albany has become vibrant and fun. We have another taphouse opening and another restaurant is rumored. What an improvement over 30 years ago! I still fear the ” back in” parking, so many people cannot park between the lines when straight in parking. Stupid! Idiotic! Typical! Welcome to Albany! business building project. What a joke and an embarrassment. Look at any “satellite” map view of Bryant Park and a few blocks of downtown. So much misuse of valuable land to park a few cars downtown. So much parking space in Bryant Park, seldom used especially during working hours. Zoom in a little to see a car or two and get an idea of the size and scale. Notice how close the Bryant Park spaces would be to the west end of downtown with an appropriately-located footbridge. Are there any other places where a growing, perceived need is better matched by an available resource? About bridge washout, that’s all about location, engineering, and risk evaluation – better done this time with lessons learned from last time. The return of a footbridge from Bryant is a great suggestion even if that park is flooded 3-4 months out of the year and closed another 1-2. Perhaps downtown biz and the local “govment” can work together to fund and manage the upkeep. Think public/private partnership. Better yet, that post office lot looks pretty good. Move them and raze the building. Instant parking! How many volunteers are we talking about? I’m guessing that most of the volunteers are over 60 so it’s unlikely that they would be up for walking from much distance. It would seem to me that a volunteer could be given a “pass” that they would put in their windshield which would allow their vehicle to park downtown for their entire shift. Parkwise had done this years ago for the Call-A-Ride volunteers when Call-A-Ride was moved to the Albany City Hall. Why not designate a spot or two in back (or in front) of the Carousel for Volunteer parking only? I like the idea of the pedestrian bridge coming back but it won’t solve this issue. It makes no financial sense for the Post Office to move. Why should the Post Office lose money and move just to “play nice”? Should I ask my neighbor to play nice and give me his yard so I can put a garage on it? I fully support the Post Office where it is, as well as the Carousel. 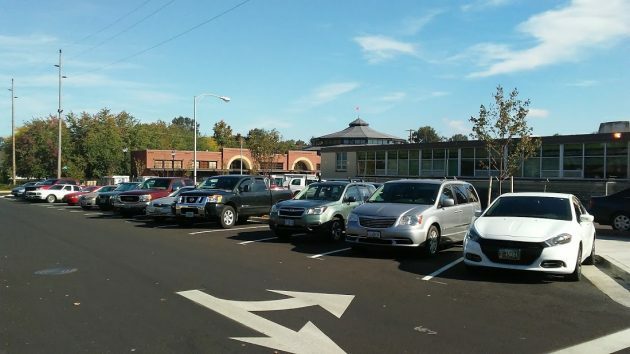 There are other parking options just across the railroad tracks, by the park and the Senior Center. That said, if the city actually owned the old City Hall (does it? I don’t think it does, but perhaps I am wrong), and if they wanted to trade that the current Post Office, then that would be interesting. But if they don’t, then as a taxpayer, I surely don’t want to spend my money buying it (or the Old Safeway) to support this move. How about moving the Post Office into the old City Hall, because that’s where they were until 1961. Then bulldoze the present Post Office building and make more parking. I read a while back that moving the post office isn’t as easy as people think. While I’m a little ambivalent about the bridge as a parking solution, I’m not going to trounce on your suggestion. The new bridge in Salem, to Minto-Brown Park, would be a good model for Albany (and would withstand floods). So, for the most part, I like the idea.